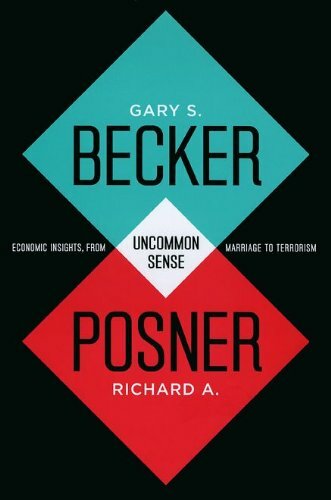 Gary S. Becker and Richard A. Posner, Uncommon Sense: Economic Insights, from Marriage to Terrorism, University of Chicago Press 2009. 372 pages, Cloth $29.00, ISBN: 9780226041018. On December 5, 2004, the still-developing blogosphere took one of its biggest steps toward mainstream credibility, as Nobel Prize–winning economist Gary S. Becker and renowned jurist and legal scholar Richard A. Posner announced the formation of the Becker-Posner Blog. In no time, the blog had established a wide readership and reputation as a reliable source of lively, thought-provoking commentary on current events, its pithy and profound weekly essays highlighting the value of economic reasoning when applied to unexpected topics. Uncommon Sense gathers the most important and innovative entries from the blog, arranged by topic, along with updates and even reconsiderations when subsequent events have shed new light on a question. Whether it’s Posner making the economic case for the legalization of gay marriage, Becker arguing in favor of the sale of human organs for transplant, or even the pair of scholars vigorously disagreeing about the utility of collective punishment, with reference to Israel’s battles with Hezbollah and Hamas, the writing is always clear, the interplay energetic, and the resulting discussion deeply informed and intellectually substantial. To have a single thinker of the stature of a Becker or Posner addressing questions of this nature would make for fascinating reading; to have both, writing and responding to each other, is an exceptionally rare treat. With Uncommon Sense, they invite the adventurous reader to join them on a whirlwind intellectual journey. All they ask is that you leave your preconceptions behind. Gary S. Becker is University Professor at the University of Chicago and the author of many books, including Human Capital: A Theoretical and Empirical Analysis. He was awarded the Nobel Prize in Economics in 1992 and the Presidential Medal of Freedom in 2007. Richard A. Posner is a judge of the U.S. Court of Appeals for the Seventh Circuit, senior lecturer in law at the University of Chicago Law School, and the author of numerous books, including How Judges Think.